Costume has hole for face, unobstructed view. You and your child have seen all of the dinosaur movies, read all the picture books, and played with the figurines but there's something strange that our society hesitates to discuss. Every picture and figurine of every dinosaur consists of mostly made up imagery. Sure, we know the basics of how the giant beasts were constructed but artists are guessing at the colors and patterns of the dino skin. We see no reason that dinosaurs wouldn't come in more colorful varieties. Maybe a stegosaurus would have rocked a turquoise hue while they stomped around the tar pits. Maybe the triceratops used to walk the earth in pink and gold polka dotted skin, it's not that crazy, have you seen some of those birds that are still around today? For all we know the T-Rex could have been a big fan of the Hawaiian shirt. Whether your kid wants to be a T-rex for Halloween or for a really cool science fair outfit, you can take some of the guesswork out of skin tone when dinosaur enthusiast dons this inflatable skeleton t-rex costume. About time the dinosaurs purists started speaking out. You can be sure the Smithsonian would be proud. Who knows where this awesome costume could take your witty kiddo? When a professor sees this pure depiction of a T-Rex walking the streets on Halloween they could offer a sweet scholarship for studying dinos. 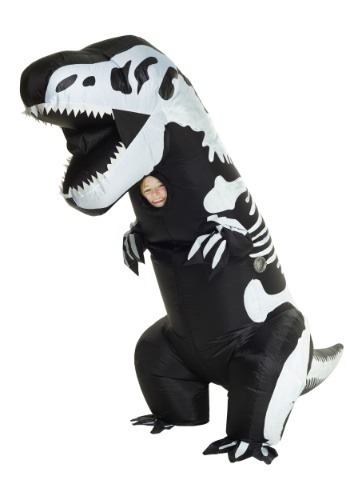 They don't need to know that this T-Rex inflatable costume was super easy to put together. All your child had to do was step inside and turn on the battery powered fan. Just promise us one thing, if your kiddo ends up leading a paleontology dig you'll have to invite us for a visit.